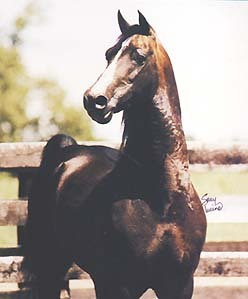 "Willy" has been one of the outstanding sires of the 1990's. 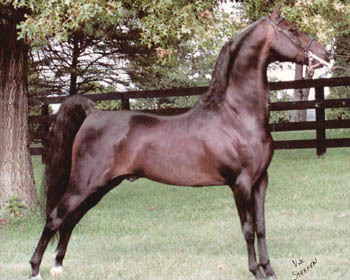 His breeder, Dr. John Stoker, bought his grandam Emanon as a pleasure mount. 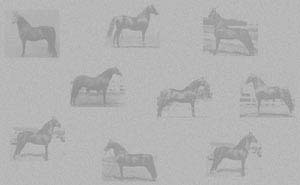 She had been bred once before purchase to the great stallion Trophy and produced the chesnut filly Trophy's Corrigan. She too was a wonderful family horse, bringing home numerous ribbons for the family daughter. 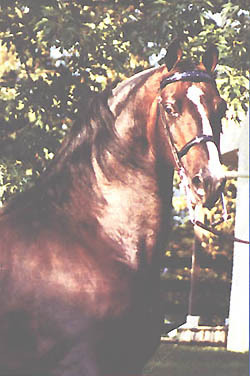 When it came time to breed Corrigan, the Stokers chose the young stallion Waseeka's In Command, in part for his prettiness and refinement, in part because of his proximity. This proved to be a great cross, producing both Willy and Wham Bam Command. The young Willy made a splash in the show ring early on and was purchased by Cedar Creek Farm as a breeding horse. I Will Command has been a consistent member of the Morgan sire elite. His championship winning get are numerous, including Cedar Creek Giselle, Cedar Creek Harlequin, Cedar Creek Legality, Sunforest Commando, DFM Keep The Faith and Will Power. Willy's offspring are noted for extreme athleticism, kind dispositions appropriate for training and showing by amateurs, and a soundness that translates into performance longevity.